In many projects a railing may be required down the middle of the flight of stairs this can easily accomplished by first creating the stair flight; in the example below the width of the stair flight is 3m. 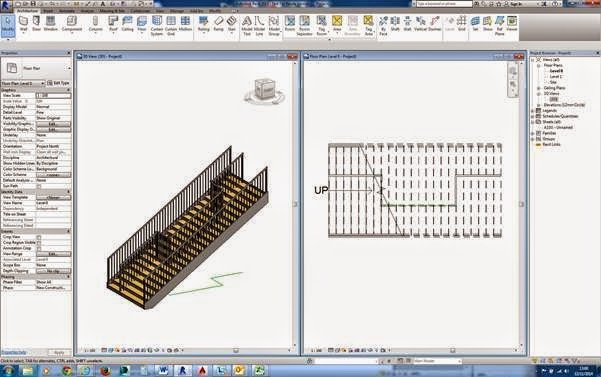 In the plan view draw the required railing path using “Sketch Path” and selecting the “Line” option from the “Modify | Create Railing Path” tab. Draw the sketch line by snapping from mid-point of the bottom tread to the mid-point of the top tread. Once created confirm by selecting the Green tick in the “Modify | Create Railing Path” tab. The railing is created but it is not located on the stair flight. Select the created railing, and from the “Modify | Railings” tab select “Pick New Host” then select the stair flight. The railing is now placed on the flight of stairs. 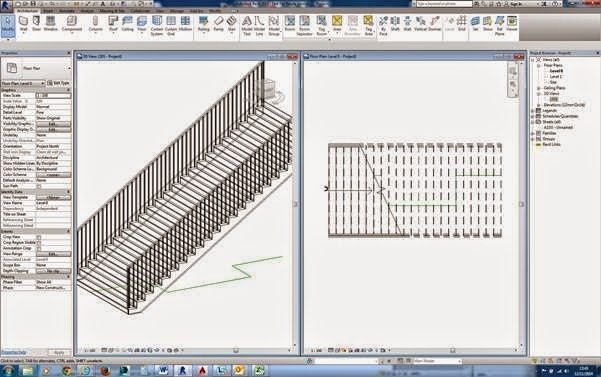 In the plan view, draw “Model Lines” of the required railing path; these will be displayed in green. To create the railing from the drawn “Model Lines” select “Sketch Path” tool from the “Railing” tool, then select the “Pick Lines” from the draw tools in the “Modify | Create Railing Path” tab and select the created model lines. To complete the command and confirm the changes select the “Green Tick” in the “Modify | Create Railings” tab. Select the created railing and again use the “Pick New Host” command and select the flight of stairs as in the previous example. Finished railing as below.